They call this governing philosophy "libertarian paternalism." That is not an oxymoron, they insist in their book. Rather it is a corrective to the longstanding assumption of policy makers that the average person is capable of thinking like Albert Einstein, storing as much memory as IBM's Big Blue, and exercising the willpower of Mahatma Gandhi. That is simply not how people are, they say. In reality human beings are lazy, busy, impulsive, inert, and irrational creatures highly susceptible to predictable biases and errors. That's why they can be nudged in socially desirable directions. As everyone knows, many guys are slobs. And, yes, we plead guilty to being guys. It is not that we set out to be sloppy. We have a lot of important stuff on our minds. Whom can we find for a tennis game tomorrow? How is our team going to defend against their three excellent wide receivers? You can see the problem. With these burdens distracting us, how can we be expected to keep a neat desk? As all women who have ever shared a toilet with a man can attest, men can be especially spacey when it comes to their, er, aim. In the privacy of a home, that may be a mere annoyance. But, in a busy airport restroom used by throngs of travelers each day, the unpleasant effects of bad aim can add up rather quickly. Enter an ingenious economist who worked for Schiphol International Airport in Amsterdam. 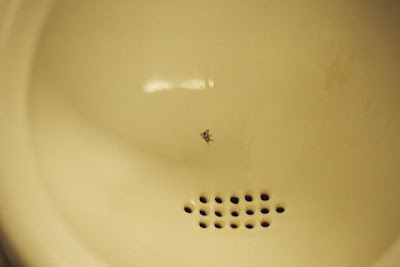 His idea was to etch an image of a black house fly onto the bowls of the airport's urinals, just to the left of the drain. The result: Spillage declined 80 percent. It turns out that, if you give men a target, they can't help but aim at it. In the grand sweep of global affairs, dirty bathrooms may be a relatively minor problem. But, by placing fly images on its urinals, the Amsterdam airport was using a technique with broad applications in the world of business and even politics. We call that technique "choice architecture". A choice architect is anyone who influences the context in which people choose--say, by deciding what order to put menu items in, or what path to encourage shoppers to take through a supermarket, or what information to give investors about their retirement savings options, or what to tell patients deciding how to deal with a medical problem. Because seemingly tiny changes in the environment can influence behavior, choice architects wield immense power. Theirs is a gentle power,they merely nudge rather than coerce. 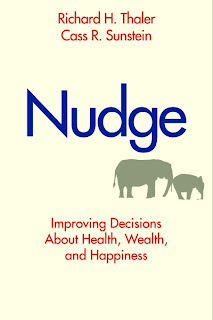 But their nudges can have major effects.